Not even the diagnosis of stage four throat and lung cancer could deter track and field coach Michael Reid from training his athletes. Reid, the head coach of American River College’s sprint team, who was diagnosed in January 2007, began to lose mobility in his jaw and shortly thereafter went to a clinic, where he was immediately referred to the UC Davis cancer center who then sent him to the emergency room. Reid endured 10 weeks of radiation for one hour and 20 minutes a day for five days a week. In addition, Reid also underwent six treatments of chemotherapy. Despite these treatments, Reid never missed a track meet or a practice. The extensive radiation that Reid underwent has left him with a totally burnt esophagus which, to this day, has made him incapable of eating and has made him totally dependent on receiving nutrition through a feeding tube. Hearing in his right ear declined by nearly 30 percent and he lost twenty-three of his teeth with the remaining ones in deterioration. “(Doctors) expected me not to make it and they gave me maybe six months but I knew I was going to get better,” Reid said. That season, ARC’s track team won the 2007 track and field state championships. At the end of the meet Reid was so exhausted that he had to be carried off the field by his brother. “The one thing that kept me alive was my sincere desire to come out for my athletes. These kids and this sport kept me alive. My wife was there for me the whole time and my faith in God,” said Reid. During his treatments, one of Reid’s doctors said something to him that has stuck with him to this day. “My doctor told me that sometimes the cure is worse than the illness. I know my limitations and that’s what can be so dangerous, you start reminiscing about what you used to be and you just got to remember that there’s always somebody out there worse off than you,” said Reid. Reid says his life after cancer has been one with less energy. “I used to sleep and now I don’t sleep at all. I sleep in one hour increments. My energy levels are much lower and I need caffeine. Give me a caramel macchiato with extra shots or a mountain dew. I was not a smoker or a drinker. Some of the healthiest people I know are dead and my wife hates when I am morbid like that but it’s not a matter of prevention it’s a matter of not wasting time,” said Reid. In September 2007, Reid was declared cancer free. Reid, who will turn 57 in May, says he doesn’t see himself retiring anytime soon. “I have an excellent relationship with the other track coaches and I love my job,” said Reid. 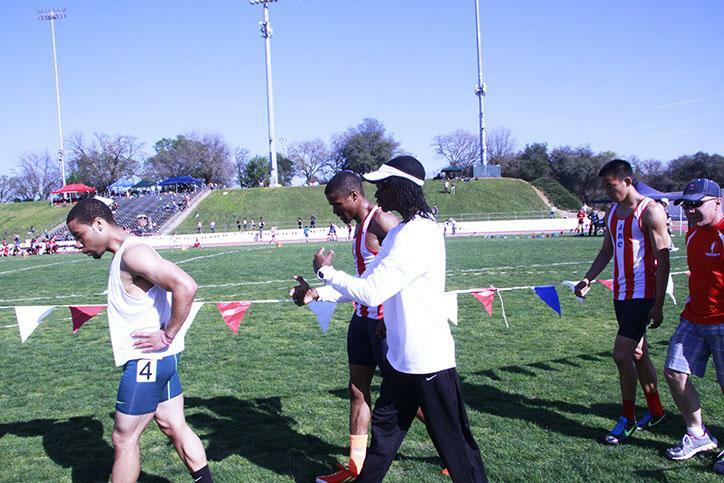 Reid is held in high regards by many of his athletes. “I admire coach Reid’s intense commitment, dedication and love he has for each of his athletes and his ability to push us past our perceived limit in preparation for competition and life in general,” said sophomore and mid-distant runner Kandace Compton. Reid says the experience has given him a ‘newfound appreciation’ for life. “For me the big change is appreciating the time that I have. I used to look to the future … where I am going to be or what I am going to be doing five years from now. You have to get everything done in the time that you have,” he said. 2 Comments on "Track coach battled stage four throat and lung cancer"
Coach Reid is one of the greatest human beings I know! I am truly blessed to have him in my life! This article literally brought me to tears. Coach Reid has been such an inspiration to me. He was/is more than just my coach. He is family. Love you coach.